I heard a great sermon this summer by my brother-in-law who pastors Cedarview Community Church in Newmarket, ON. It was one in a series of messages dealing with New Testament worship. 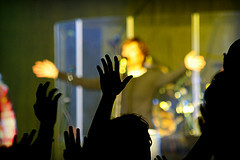 As someone who has grown up in a charismatic church, I’ve seen a lot when it comes to worship. Some of it very powerful and some of it didn’t seem very authentic. I’ve concluded that in many cases, worship is a matter of personal preference and taste. I realize now that God, while allowing us to be individuals does require us to follow some principles and guidelines. Most Christians sing hymns of praise. Why? Is it tradition? Partly but mostly because the Bible shows us time after time that singing and music are pleasing to God and is one way we can express ourselves to Him. Another practice which I’ve always been comfortable with was raising my hands. Until this message, I didn’t really know why. As Christians, we see the teachings of the New Testament as the fulfillment of the old. When it comes to how we live, we understand the many ideas of the Old Testament were made obsolete (Hebrews 8:13) Part of how we determine what is and isn’t to be practiced from the Old Testament is checking to see if the ideas or practices are encouraged or reinforced in the new. The lifting of hands is mentioned several times in the New Testament. 1 Tim 2:8. To remind us of our covenant with God. To show our reliance on Him. If God likes it, why wouldn’t we do it? So this isn’t about what church you go to or what style of worship you prefer, it’s something God has asked us to do because he desires worshippers. So the next time you raise your hands in worship, perhaps, if you’re like me, you’ll know better why you do it. If you don’t, why not? Thanks so much for this wonderful piece of information with scripture to back it up. I am going to repost this on our Sunday School blog. I attend a Baptist church that is very open to freedom in worship. I was raised in a church where nobody raised there hands, moved, clapped, or uttered a word other than the occasional AMEN! It was at my father’s funeral where I first saw my family surrender to worship. Towards the end of the funeral sermon, we played the Mercy Me song I Can Only Imagine. It was so awesome to sense the Holy Spirit’s comfort that my husband and I stood up and raised our hands to God in thanks for my father’s life and his commitment to Christ. I saw my family join us and felt the worship and presence of God. I am thankful that I am in a church now that allows my children to understand the freedom to be quiet and reverent or to lift and claps hands in praise to our God who deserves it. Dude. I’m honored that you used one of my photos on your website. And also a great article by the way. Good point well made – worship, both sung and lived, is really more about obedience than preference!